I had just sat down to work and opened up my e-mail and noticed the name "Kim Nichols" in my inbox. Then,next to it in the subject area, it said "Favorite Room Guest Post". I grabbed my glasses (I needed to be able to see for this one) and quickly clicked over. I felt honored, happy, excited…even nervous. 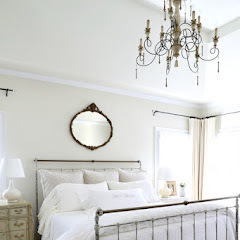 Kim was asking me, the little redhead who likes to decorate up in Michigan, to share my favorite room! I responded back immediately with a big fat "
Are you kidding!? Me???Yes! I'll be there!" It's my day on "Savvy Southern Style"! I am thrilled to be here with you, and I can't wait to share my favorite room with you. First, I would like to tell you a little bit about who I am. 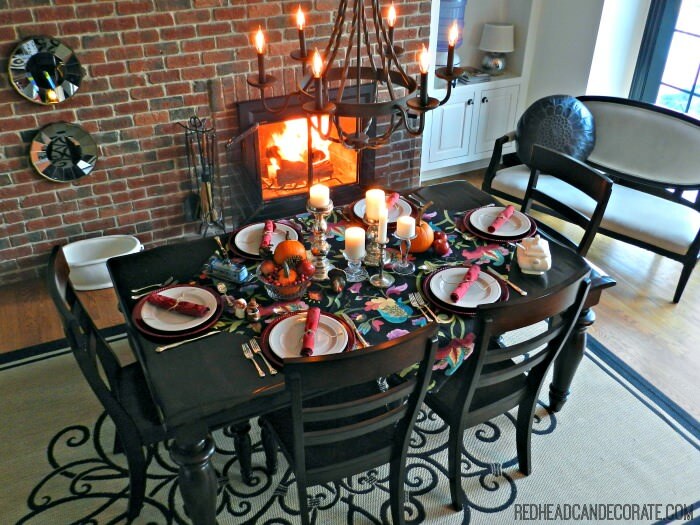 My name is Julie, and I blog at redheadcandecorate.com. I am married 20 years this August to my college sweetheart. We are blessed with 2 beautiful girls, and 1 sweet kitty we rescued. We live in Southeast Michigan in a large suburb called Lake Orion. We are surrounded by many lakes in Michigan, including the Great Lakes. 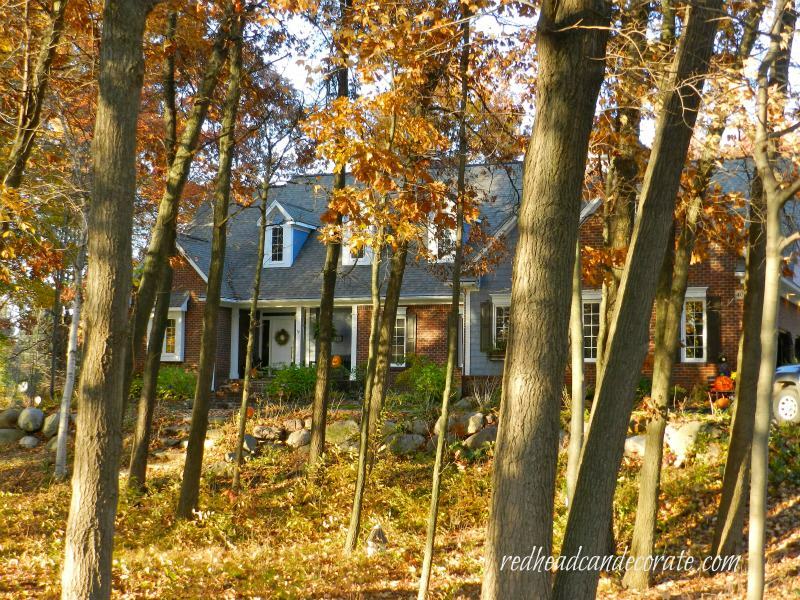 We purchased our "Cape Cod" style home in 2008 after my husband was transferred. It needed a ton of work, but we loved it's charm. 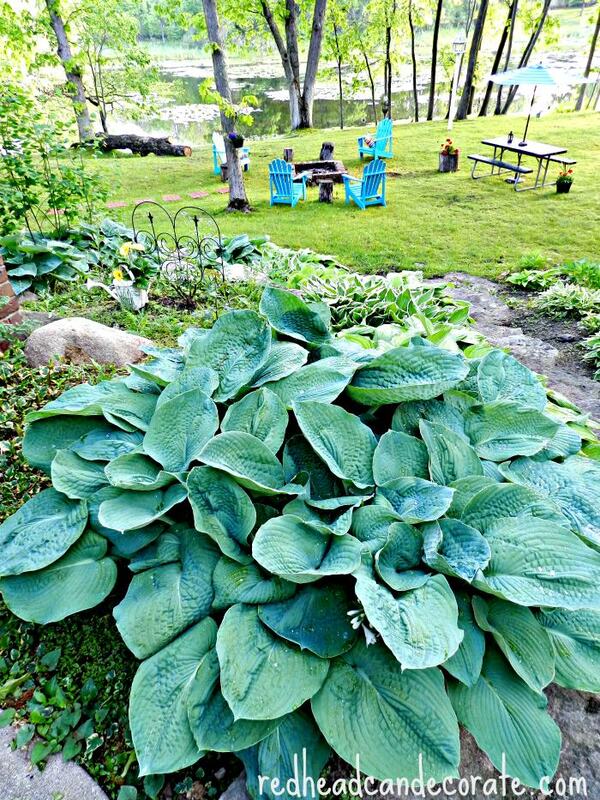 From the yard, to the faucets…we had big plans. Over the last 7 years, we've managed to transform the home into our special little nest in the woods. The home is now full of special memories I'm sure I will wish back one day. Within those moments, there is one room that stands out the most. Our kitchen is home base. It's where we all meet in the mornings, the evenings, and even for midnight snack attacks. I guess you could say that I'm the head coach. Standing behind home plate up there directing all the players. to memories of our dog, Dude, eating his raw hide. When we first walked into the kitchen, it was as if a spell was cast. 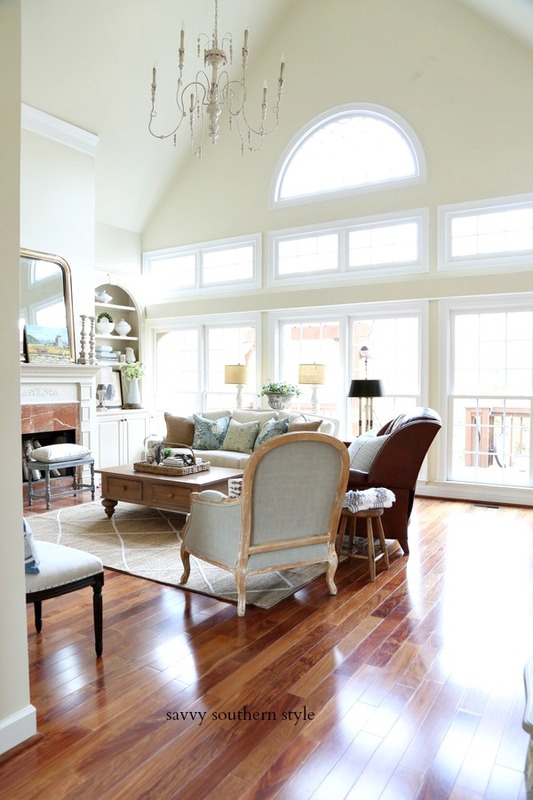 I was instantly attracted to the beautiful cabinetry and fireplace. None of the houses we had looked at came close to the unique features this house holds. 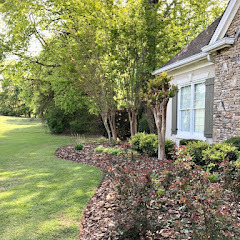 Somehow, I managed to look past all of the updates that were needed, and I recognized the good bones underneath. The idea to paint the cabinets didn't come until about a year later. I wasn't a blogger yet, I didn't even know what a blog was. In fact, I was very busy taking care of our oldest daughter. She had become ill and it was a scary time for our family. In the middle of it all, I began painting the cabinets black. I know…crazy what stress will do. I guess you could say, in the darkness, I found light. I needed the escape, I needed the therapy. 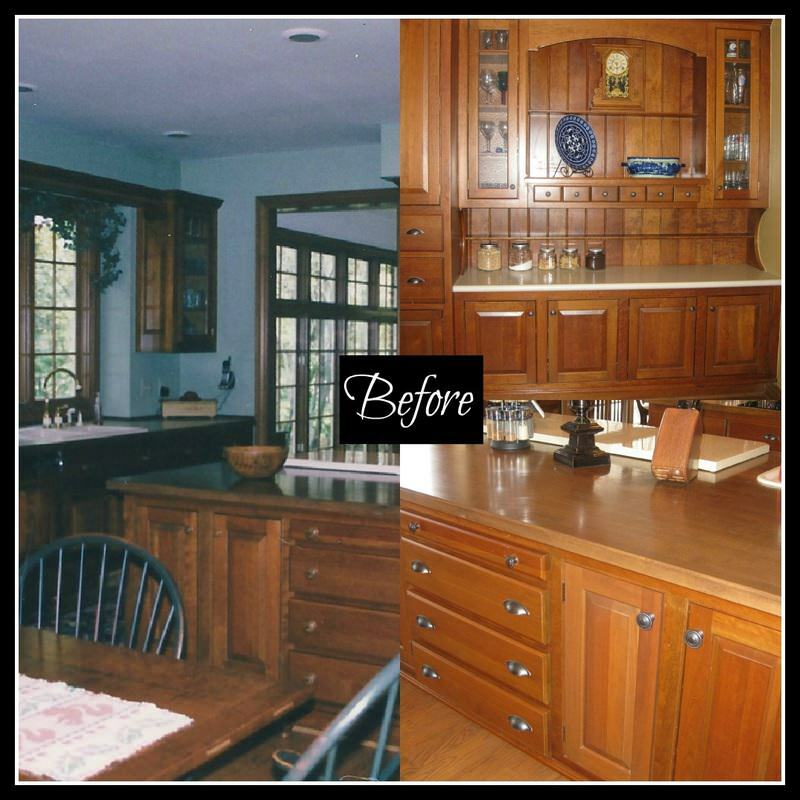 Painting the cabinets brought me comfort, and kept me busy when I was full of worry. My hubby became involved and the more we did, the more we knew how beautiful it could become. I'm very happy to let you know our daughter pulled through. She is a healthy teen now, and we are extremely thankful. In many ways, our kitchen is the result of the strength and courage we needed at that time in our lives. We continued to paint, a lot...and finally began to add details that would take it up a notch. The cabinets were painted a mix of black and white to balance the light. 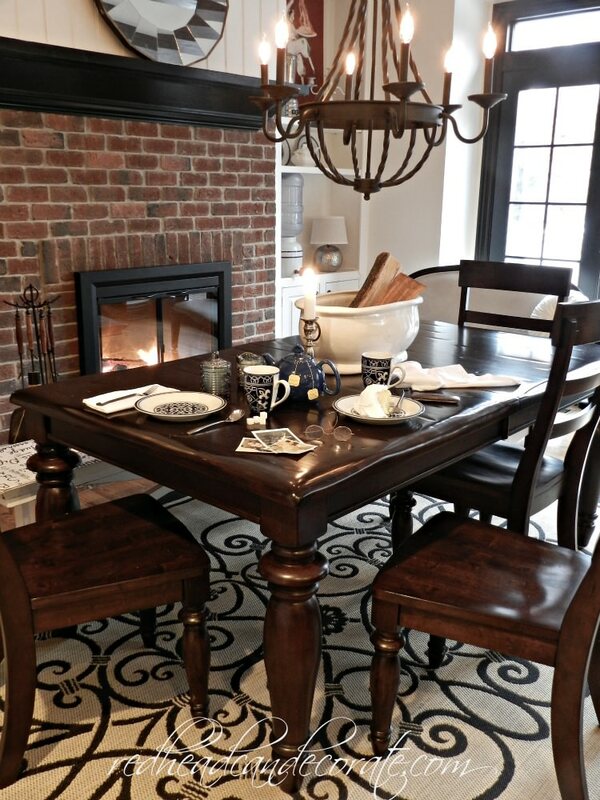 We added rustic accessories through out the kitchen. Everything we did was done with a strict budget in mind. My husband and best friend made the beams/column in our garage, and we found the light fixtures on sale. I made the "X" moldings in the windows out of moldings from Home Depot. We sanded down all of the oil rubbed bronze knobs to make them look like copper. We also installed all of our own faucets. Now a days, I decorate it with things that don't cost a fortune. For example, I used stickers to decorate our pantry door. I made this DIY candelabra vase from old ceiling fan shades. 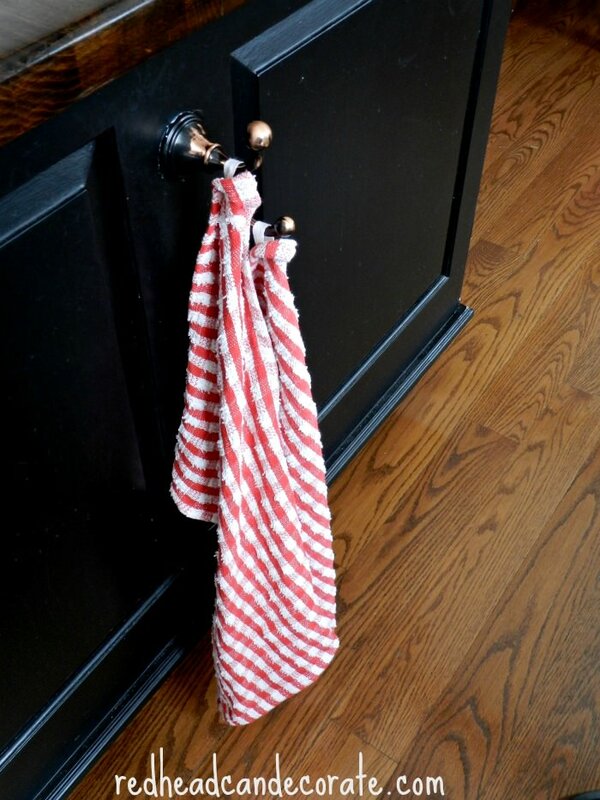 I found these red & white checkered dish towels at the dollar store. 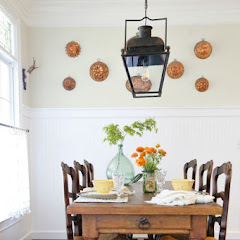 The rustic iron light fixture is also from Home Depot for a steal. I almost forgot to tell you that we spray painted our 25 year old fridge panels. Knock on wood panels, this baby is still breathing. our kitchen is where we celebrate the life we are blessed to live. Oh, and I do a lot of my blog work there too. It's funny how everything fell into place. After our daughter was feeling better she told me I should write my own blog. Our kitchen has been there for us through it all and represents the love and hope our family holds. 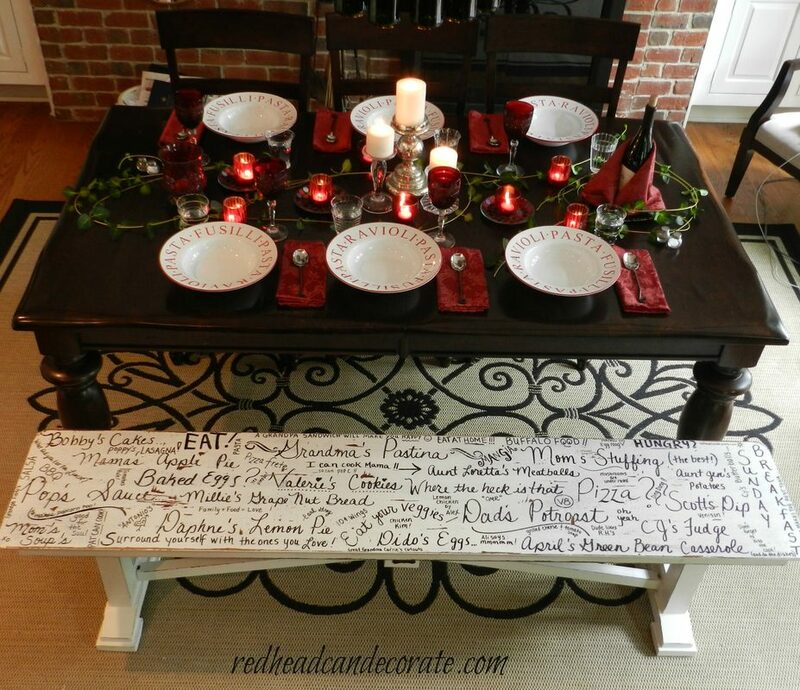 I hope you enjoyed it, and I hope you will stop over to see me at redheadcandecorate.com soon. Thanks for inviting us over, Kim! Thanks so much Julie for letting us in to view your favorite room and for getting personal with us. Your kitchen is a beauty. 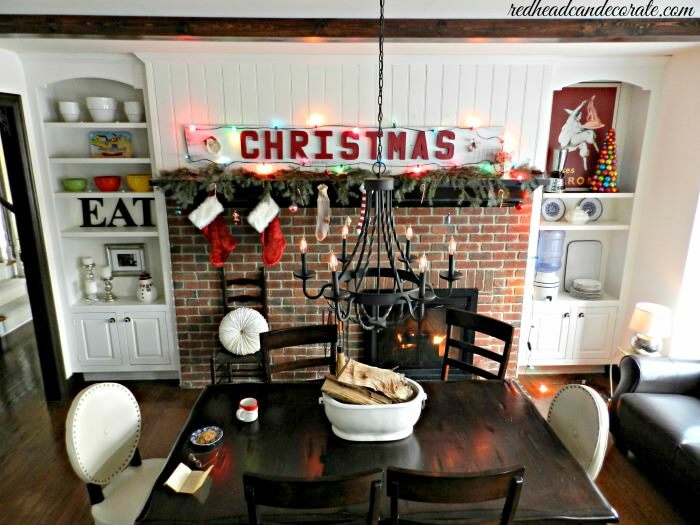 If y'all don't don't know Julie and her blog Redhead Can Decorate then hop on over there and get inspired. Thank you, Kathy! I haven't been able to open up about it too often, so this was excellent therapy as well. Your kind words mean so much. Hi, Bev! Michigan is a beautiful state. I would love to see your kitchen! 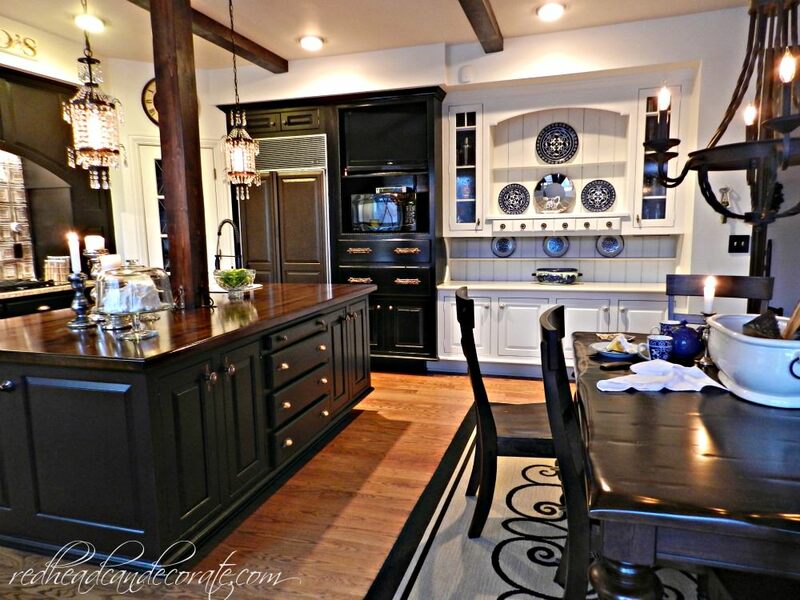 Julie's kitchen is jaw dropping!...I complain about my dark kitchen and now she is inspiring me to "go with it"...and maybe take that plunge and paint my island...I am so happy that her daughter overcame her illness...and I had the same experience with my son telling me to start a blog....A blog??? What is that? ?...So happy that Julie listened to her daughter as it is our gain! 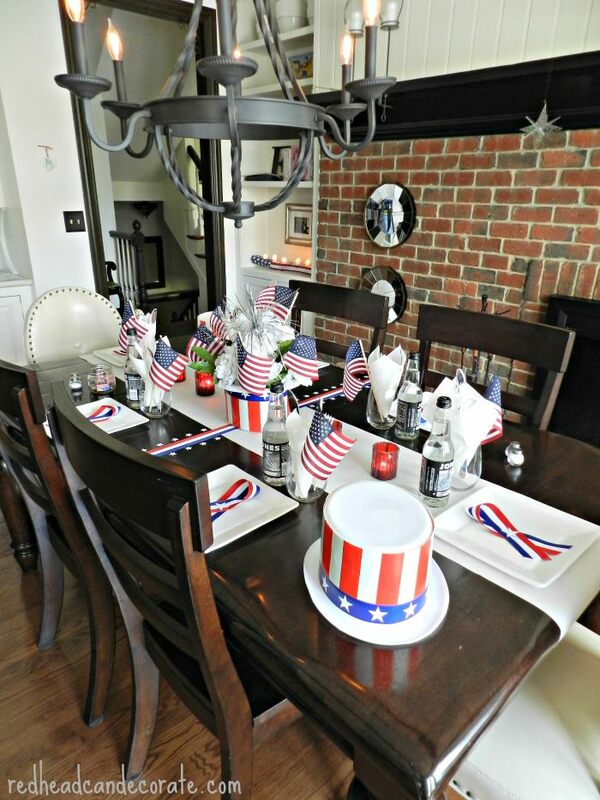 !...Love that candelabra ! !..How so very creative!...Wonderful story and beautiful feature...thanks Kim and Julie...Have a great weekend. Thank you, Shirly! I think Daphne regrets it now,lol. All the unfinished projects all over the house! Julie's kitchen is Amazing!!! I love her spirit and energy, and the story behind the transformation! I need to go now and check out her blog. oooo, I hope you stop by, Mary Alice. Thanks so much for your kind words! Her kitchen is fabulous. I love everything about it. * remember the first time I saw your kitchen Julie... had to return and re look! It is beautiful... I can truly see why it is the heart of the home. The black and white is stunning. Thank you, Gee…have a great weekend! Oh Ellen…I've had the hardest time with trying to get them to color it the right red. Sometimes it's pink!! lol Thank you for your kind words! What a beautiful kitchen and so glad to hear your daughter is in good health now! Thank you, Shelley. We are so grateful. What a gorgeous room! I enjoyed this thoroughly, but even more than the outstanding room, I enjoyed your way with words and upbeat attitude. Thank you, Pondside. That made my day! OH MY GOD. This is my kitchen dream! It's lovely :) Hope you guys have a great weekend♥ Kisses from Argentina! Thank you, Albertina from Argentina!! What a fantastic kitchen! I am happy the daughter is healthy now, but it is amazing sometimes what creative visions can arise out of the angst of the soul. That is some seriously gorgeous kitchen!! Thank you Victoria! It's a mess right now, I better go clean it up!! As the mama of two redheads, I was instantly drawn to the name of your blog! ;-) And yes, redhead can decorate BEAUTIFULLY! I love the outside of Julie's home, the yard, and definitely that gorgeous kitchen. Thank the good Lord that her daughter is fine and that Julie discovered her outstanding talent to share with all of us. Thanks, Kim and Julie, for the fantastic feature today! Thank you, Mimi! So nice to meet you. Your kind words lift me right up! 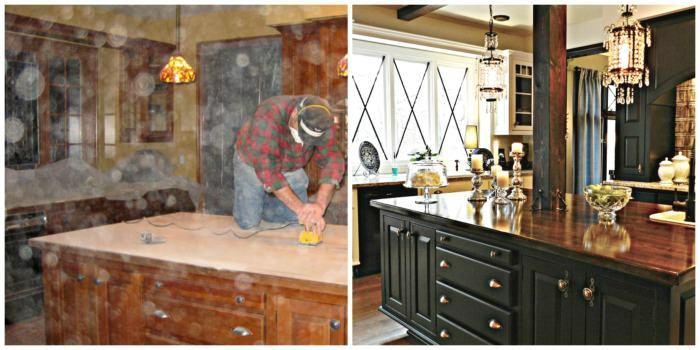 What a gorgeous kitchen and what a beautiful from-the-heart story to go along with it. Yes, painting can definitely be therapy. So happy her daughter pulled through. 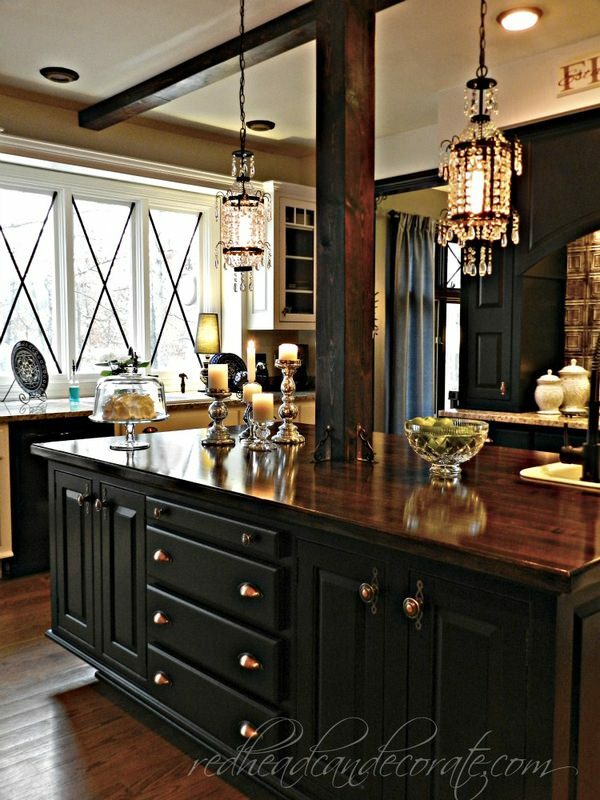 That kitchen is delightful with its contrasting color cabinets, and the candlelabra is soooooo clever! Loved it all. Thank you Kim for sharing it with us, and thank you Julie for all your hard work and creativity that you shared here. What a beautiful kitchen! I am heading over to visit and sign up to follow, because I want to see more! Thank you, Penny! So happy for that!! Yay! Lots of Michiganders! Nice to meet you, House Crazy in Michigan! Such a beautiful kitchen...it would be my favorite room, too! 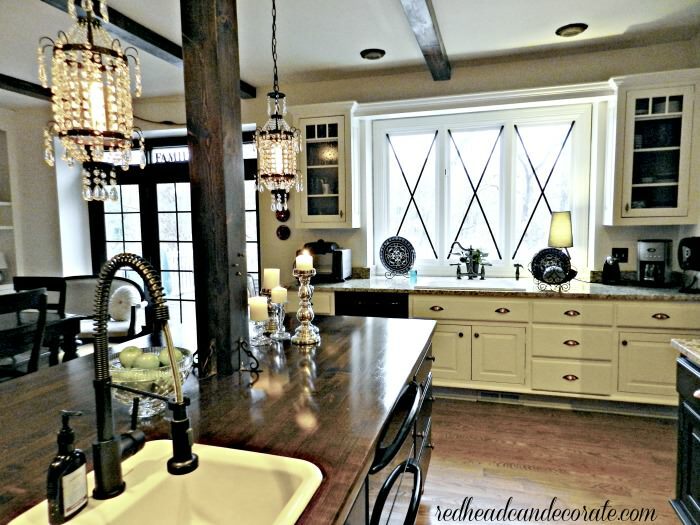 I so loved seeing this beautiful kitchen and reading the story of the family who is behind it. 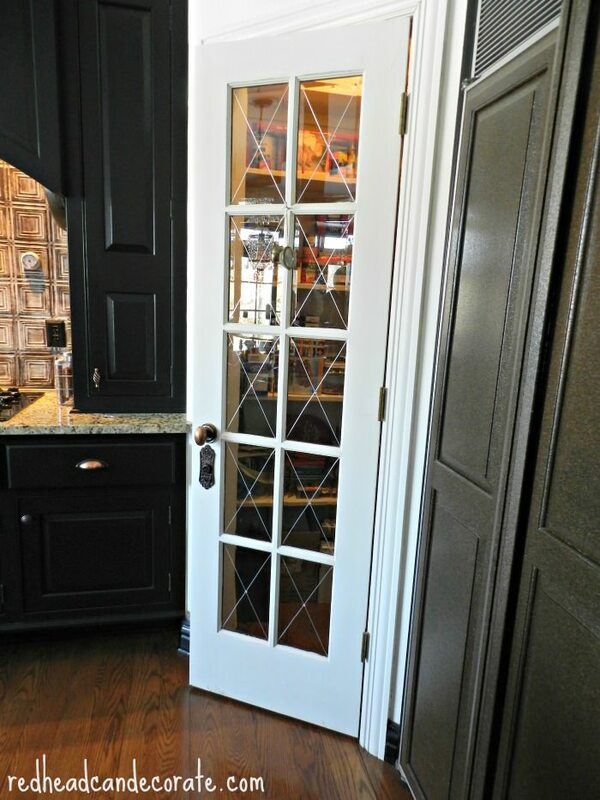 Julie you and your husband have done such a fabulous job giving your kitchen a custom, high end look and I love all the personal touches you added. 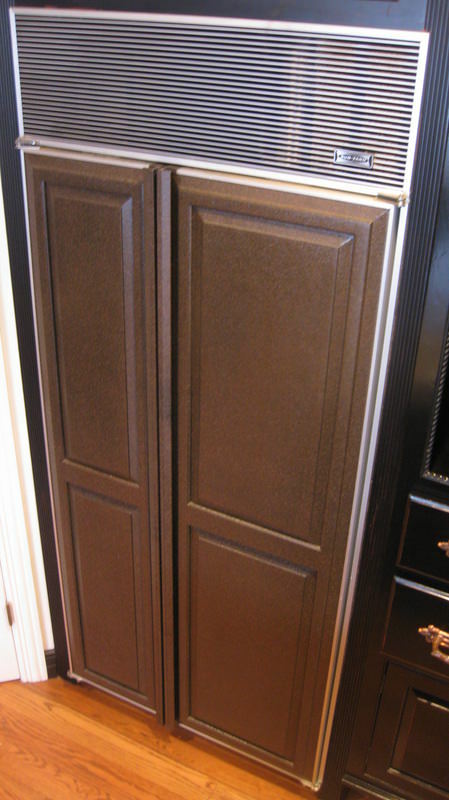 The black cabinets are gorgeous, especially with the copper hardware! 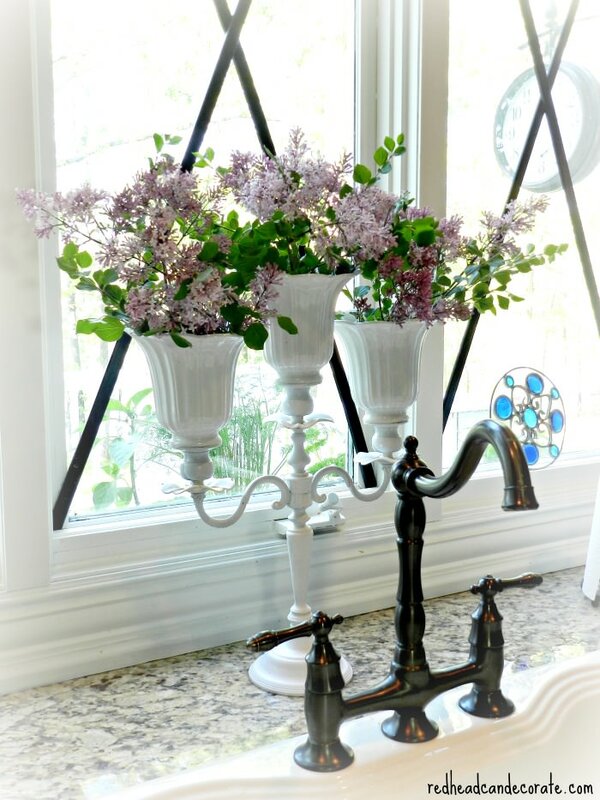 Love Redhead and what she did to her kitchen! I remember seeing it when she first revealed it and I thought it was simply amazing! So glad her daughter recovered and is doing well now. Thanks for sharing it, Kim! Julie's kitchen is just gorgeous and I love the lighting they chose and the black cabinets are just stunning with the counters. I am headed over to become a follower, thanks for this great post!!! So happy to meet you, Cynthia! Julie, I love what you have done with your kitchen! The black looks so rich and inviting. The idea of sanding your knobs to make them look copper is brilliant! Love love it! Hi, Janet! That sanding down trick is so easy. The only thing is you have to polyurethane them after so they stay copper! But it just takes a second to brush it on. Hi Kim - Thank you so much for inviting Julie to share her kitchen. Julie - Your kitchen is a total reflection of you... comfortably stunning. It's absolutely beautiful and very welcoming and warm and... home. My redheaded sister, Holly! I love ya!! 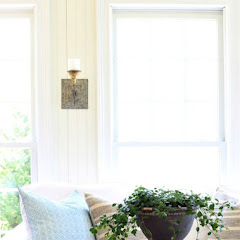 I just love Julie's blog and kitchen. So pretty and a heartwarming story. Thanks for sharing it with us. I LOVE your kitchen -- outstanding heart of the home room! I am hopping on over to your blog - cannot wait to hear more! So nice to meet you! Thank you, Dah! Very nice to meet you too! Your kitchen is gorgeous! You're in southeast Michigan and I'm in mid-Michigan, I'll bring dessert when I visit! Kim what a home run you hit with this gorgeous kitchen of Julie's!!! Wowzer! LOVE IT LOVE IT LOVE IT and I wish I lived closer to Michigan!!! 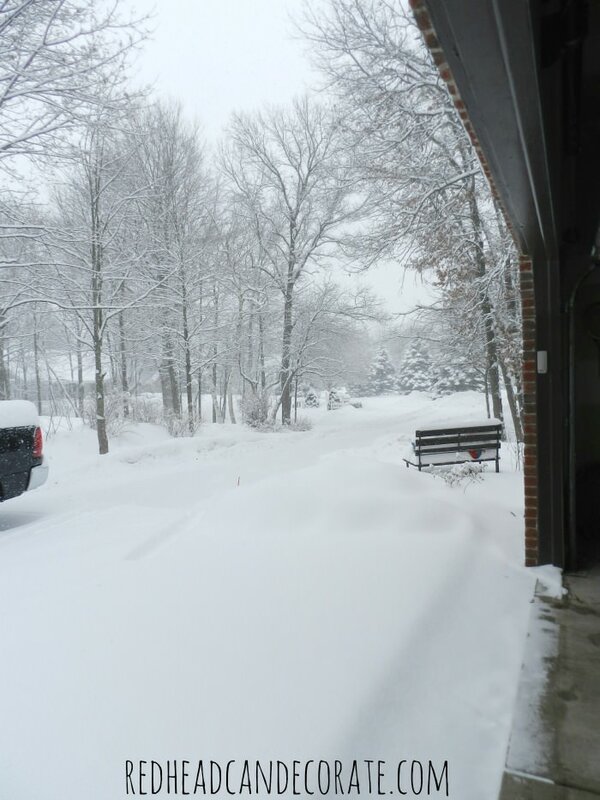 Hope you are enjoying some warmer temps out there in Michigan Julie and thank you Kim for sharing Julie's fabulous Kitchen in your incredible blogger series! Happy summer solstice to you both. Thank you, Barbara! We are actually going strawberry picking today! Woohoo!!! Wow Julie your kitchen is gorgeous. I grew up in Michigan and know what a beautiful state and the area you live is. Simply gorgeous. I can see why it is your favorite room. After all that is where we spend the majority of our time so it should be comfy, cozy and inviting. 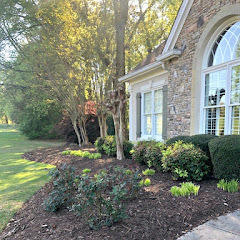 You knocked it out of the park on your kitchen rehab. Beautiful. Thank you, Kris! Another Michigan neighbor! Julie is awesome and so is her Kitchen and everything else she shares! Great share Kim and I know Julie is over the moon today. 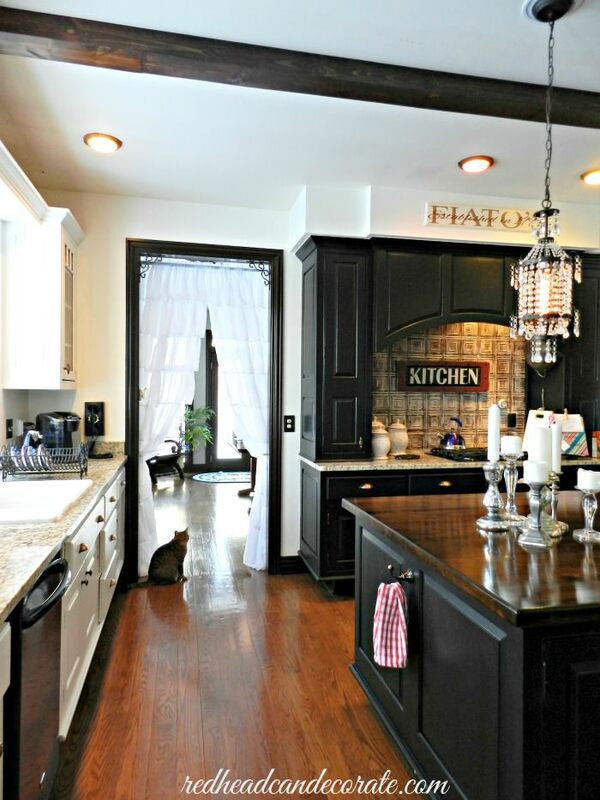 When I saw the very first photo of the kitchen, and that fabulous black cabinetry, I said, WOW! It is just stunning, and what a story behind it. It makes every celebration in it all the more special. I love every detail of Julie's kitchen! I really love the use of black in your kitchen. It gives a very sophisticated vibe. It looks like a wonderful family space. Whenever I see Red's kitchen I almost get the courage to do my kitchen cabinets dark with some light thrown in. I don't know if I could make it work, but one thing is for sure, she did! I fell IN LOVE with Julie's kitchen the first time I saw it, when I first started following her. But never knew the story behind it. I am SO happy for her that her daughter has pulled through and is healthy now! She really CAN decorate, that's for sure!!!!! Thanks to you both, Love this feature. Thank you, Pinky! Your words are very sweet, and we are so thankful too. May I ask what type of black paint you used? It is so beautiful. 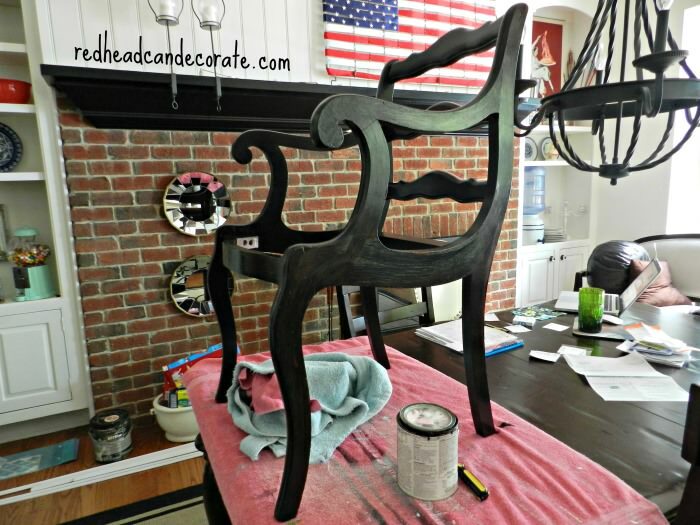 I am wanting to paint my serving cart black and turn it into an island. Your home is beautiful. Deb, this is an old guest post series and Julie won't be answering this. Click over to her blog and ask her there. I'm sure she will be glad to answer you.